My oldest daughter temporarily arrived here from her summer internship en route back to school. She was travelling with a fellow school friend, who also had an internship at the same place. Her friend has a laptop computer that has one of those stretchy knit protective cover things to protect it from bumps and scratches. Her friend was very, very interested in my Janome 300e, so of course, as a proud parent, I showed it off. :-) He then asked me if it would be possible to embroider his name and phone number on the front of the cover. Goodness, was I flattered! It's the first time one of her friends has ever exhibited any sort of interest, feigned or otherwise, in any crafting/embroidery/quilting stuff that I've done. After looking through my fonts, we realized that everything I had was much too big for the laptop cover BUT the built-in font, Gothic in the small size, was almost perfect. I created his name and the 2 phone numbers that he wanted, saved the 3 items to a compact flash card, opened them in Embird and resized them ever-so-slightly smaller then joined them all into one design file. 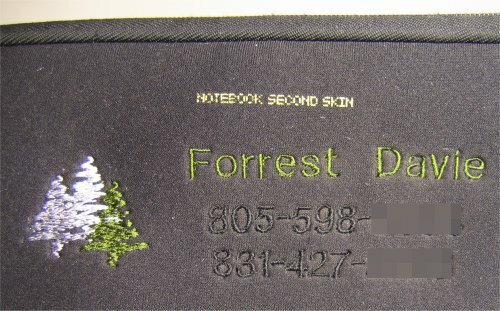 As a play on his first name (Forrest), I found a free Christmas tree design, and in Embird, removed the star from the top and replicated it twice, so we'd have a "forest" of trees. This trio of trees was then merged with the name & phone numbers. The single Christmas tree was found at Designs in Stitches on the Free Designs, page 1 .... and is part of the "3 Mini Xmas Designs" download. Because I couldn't hoop the laptop cover, I used a sticky stablizer to secure the cover. I didn't use any dry cover on top; I'm not sure if I should have or not. I'd love to say that the entire stitching went perfectly ... in fact, it all DID go quite well until I got to the Christmas tree, which was stitched last. At that point, I developed a bird's nest of bobbin thread .. twice! But I was able to pick all the threads out (twice! ), find the offending piece of thread in the bobbin case (twice!) and patch the stablizer. Luckily, the stablizer was very lightweight and I was able to simply stick a patch over the area where I had picked out all the stitches! I've pixelated part of the phone numbers for privacy reasons, but the stitching looks just as nice as the rest.